Can a TIPS investment go bad? Yes, it can. An ugly example. My philosophy for investing in Treasury Inflation-Protected Securities is to buy them at auction when the yield is attractive, and then hold them to maturity. At the very least – in almost every case – you will get the original investment back at maturity, along with the biannual coupon payments. But there are cases where a TIPS investment can backfire. Although rare, this generally involves buying a TIPS at a reopening auction where the yield is set well below the coupon rate. Or, buying a new TIPS at auction where the yield is strongly negative to inflation. Since TIPS carry a coupon rate of 0.125% at the very least, buying TIPS at a time of negative yields can be expensive, and create added risk. An example. Take the most recent auction of a new 5-year TIPS on April 23. The yield at auction was -0.335% and the coupon rate was 0.125%, so buyers wanting to invest $10,000 in this TIPS paid about $10,252 for $10,000 of par value and a 0.125% coupon rate, which generates about $12.50 a year in income. So, roughly, five years of coupon rates are going to pay the investor $62.50 (this will rise slightly with inflation). That leaves a shortfall of about $189.50 that the investor needs to make up in the next five years. In theory, rising inflation will push up the principal balance and will make up the difference. But if it doesn’t, the investor will never make back that original investment. Remember, par is $10,000, and that is all the investor will get back if there is zero inflation or deflation during the five-year term. An extreme case. While working on an analysis of that April auction, I noticed a particularly ugly example: The 4-year, 4-month reopening of CUSIP 912828SQ4 on Dec. 20, 2012. This TIPS has a coupon rate of 0.125% and auctioned with a yield to maturity of -1.496%. Here’s the fact sheet. Back on December 20, 2012, I looked at this TIPS and wrote: “I mean, who really cares? Who is actually buying this thing?” On December 10, 2012, I advanced the auction and tried to steer buyers toward I Bonds instead. In other words, I wasn’t a fan. But I had no idea how much of stinker this would become, because it was issued just before a period of deflation in the US economy. Because of the spread between the coupon rate and the negative yield to maturity, the buyer of this TIPS paid $10,918 for adjusted principal of $10,184 and a par value of $10,000. When this TIPS matures on April 15, 2017, only the par value is guaranteed. So far, the combination of months of deflation and inflation has caused the inflation index to rise from 1.o1844 in December 2012 to 1.03898 in May 2015, but that isn’t enough to make up for the initial $733.60 extra cost of this TIPS. 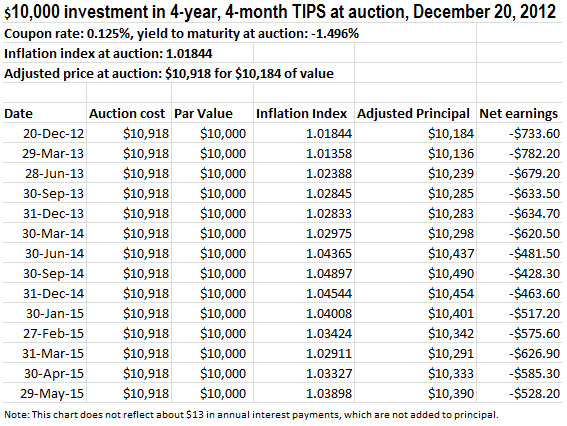 Adjusted principal has risen from $10,184 to $10,390, still far below the initial cost of $10,918. This particular TIPS is a ‘horror story’ – it was expensive and purchased just before an extended time of deflation. Even if inflation averages 2% a year for the next two years – best case scenario? – its principal value will rise only to about $10,810, still a bit below the original cost. The lesson. Be wary of buying TIPS when the yield to maturity is well below the coupon rate. In today’s market, with a 5-year TIPS yielding -0.11%, the risk is minimal and acceptable. 11 Responses to Can a TIPS investment go bad? Yes, it can. An ugly example. Unrelated somewhat, but good to know. Some might be inclined to skimp on their emergency fund because Treasuries are the most liquid security around and could be sold quickly if necessary. Of course the securities would have to be transferred to a brokerage account from Treasury Direct. How long might that take? At the present time…. 10-12 weeks! Being prepared to hold to maturity is wise advice. The fact that there is apparently a large volume of retail customers bailing surely indicates something, but I’m unsure of what. I’m putting this here because this is the ONLY place I know of that provides in-depth coverage of TIPS and does it well too. Good on you! Len, thanks. I have never done this transfer from Treasury Direct, but I have heard it can be a difficult, time-consuming process and involves paperwork. I did not thoroughly follow your analysis, but I think the following is true … Do you? YTM is the truth, if you hold to maturity. Negative YTM reflects loss of purchasing power. DURATION reflects when, along the way to maturity, you receive money. Ed, I am hopeless when it comes to duration. What a lot of people don’t realize is the YTM is locked in stone. You buy a TIPS with a yield of -1.496% and you are going to lag inflation by -1.496%, and it doesn’t matter if inflation drops to zero or climbs to 10%, you are going to get a total return of -1.496% less than inflation (including the coupon payments). Quite interesting and useful, but, in a way, it also makes the case for the relative safety of TIPS. If the worst case we can cite is losing $528 (if you are desperate enough sell today) over a 30 month period on a $10,918 investment, that strikes me as a pretty low downside. And, the buyer did get inflation insurance, the value of which you are not factoring in your analysis. MGK, I agree that this TIPS could end up returning the original investment after 5 years (best-case scenario), in effect a zero return and about 1.5% less than inflation. A more likely scenario is that it will trail inflation by around 2%. A 5-year bank CD at the time was paying 1.8%. Even in the best-case scenario for the TIPS the bank CD would have returned about $940 more than this TIPS. … I am a big fan of TIPS, but there are times when they are extremely unattractive. This auction was one of those times. Allow me to (respectfully and appreciatively) push back a little. I think you are, essentially, advocating market timing. But to make that argument convincing, you would have to explain why market timing is likely to work for TIPS, when it has been shown that it doesn’t work well for other tradeable asset classes, such as stocks or nominal bonds. A priori, no one “knew” that oil prices would plummet, which is the major reason buyers of this TIPS got hurt. Actually, that $528 loss is based on the principle adjusted value of the bond. If you sold it on the secondary market on 5/8, you’d only be losing about $44. So, this might be a good argument for dumping this bond now to prevent a bigger loss later. That’s not trading, that’s cutting your losses. Last December, I bought a similar 4 year 4 month re-issue that matures on 4/15/2019. A that time the YTM was .395%. The inflation adjusted price was $1000.75 per bond. Due to deflation, it’s now has an inflation adjusted value of $991.55. Although that’s only a loss of $10.20 per bond, percentage wise that’s 1% in about six months. I’m never going to make up that loss during the remaining life of the bond with the paltry amount of interest that it generates every six months. Only inflation is going to get this puppy out of the hole. Right now, that bond is selling for $1021. Although that’s only a gain of $19.25 per bond, percentage wise that’s a gain of 2% in about 6 months. If I unload this dog now, I’m ahead 3% versus the adjusted principle value of the bond. I didn’t get into TIPS to do this sort of trading. However, I’ve been making a lot more money trading than I have on accrued interest and inflation. And, in this particular case I don’t see the wisdom of hanging on to bonds that have a paper loss due to January’s huge deflation numbers. Jimbo, for CUSIP 912828SQ4 I am seeing a current price of about $101.80 and an inflation index of 1.035. So the current value of $10,000 par is $10,536, and that’s still $382 less than the original investment. The yield has risen from -1.496% in December 2012 to -0.837% today. Right! I slipped a decimal point when I didn’t convert the $1,000 bond to your $10K example.